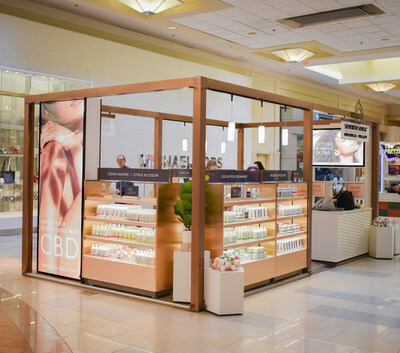 COLUMBUS, OH, Feb. 13, 2019 – Green Growth Brands, Inc. (CSE: GGB) (OTCQB: GGBXF) (GGB or the Company) is pleased to announce the opening of its first Seventh Sense CBD Shop at the Fayette Mall in Lexington, Kentucky. This location represents the first of hundreds of shops planned to serve customers at locations across the United States. 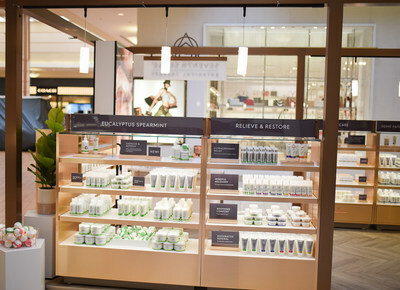 The shop is approximately 200 square feet in size and is located in a prime location of the mall, adjacent to the high-end and high-traffic retailers. The Seventh Sense CBD shop retails high-quality botanical therapy CBD-infused personal care and beauty products at affordable prices. The ever-expanding product offering includes CBD-infused body lotion, muscle balm, body wash, bath salts, sugar scrub, bath bomb, lip balm, and face oil. Green Growth brands expects to dominate the cannabis and CBD market with a portfolio of emotion-driven brands that people love. Led by Peter Horvath, the GGB team is full of retail and consumer packaged goods experts with decades of experience building successful brands. Join the movement at GreenGrowthBrands.com. Certain information in this news release constitutes forward-looking statements under applicable securities law. Any statements that are contained in this news release that are not statements of historical fact may be deemed to be forward-looking statements. Forward-looking statements are often identified by terms such as “may”, “should”, “anticipate”, “expect”, “intend”, “forecast” and similar expressions. Forward-looking statements necessarily involve known and unknown risks, including, without limitation, risks associated with general economic conditions; adverse industry events; marketing costs; loss of markets; future legislative and regulatory developments involving medical and recreational marijuana; inability to access sufficient capital from internal and external sources, and/or inability to access sufficient capital on favorable terms; the marijuana industry in the United States, income tax and regulatory matters; the ability of the Company to implement its business strategies; competition; currency and interest rate fluctuations and other risks, including those factors described under the heading “Risks Factors” in the Company’s Annual Information Form dated November 26, 2018 which is available on the Company’s issuer profile on SEDAR. Readers are cautioned that the foregoing list is not exhaustive. Readers are further cautioned not to place undue reliance on forward-looking statements as there can be no assurance that the plans, intentions or expectations upon which they are placed will occur. Such information, although considered reasonable by management at the time of preparation, may prove to be incorrect and actual results may differ materially from those anticipated. The forward-looking statements contained in this release is made as of the date hereof and the Company is not obligated to update or revise any forward-looking information, whether as a result of new information, future events or otherwise, except as required by applicable securities laws. Forward-looking statements contained in this news release are expressly qualified by this cautionary statement. The securities referred to herein have not been and will not be registered under the Securities Act of 1933, as amended (the ”Securities Act“), or under the securities laws of any state or other jurisdiction of the United States and may not be offered or sold, directly or indirectly, within the United States, unless the securities have been registered under the Securities Act or an exemption from the registration requirements of the Securities Act is available.